But already in the middle of the 1930s, Mott's interests had broadened to include solid states, leading to two more books that would have a great impact on the development of the field in the years prior and after World War II. In 1936, Theory of the Properties of Metals and Alloys (written together with H. Jones) describes a simplified framework which led to rapid progresses. The concept of nearly free valence electrons in metallic alloys explained the special stability of the Hume-Rothery phases if the Fermi sphere of the sp Valence electron, treated as free, would be scattered by the Brillouin zone boundaries of the atomic structure. The description of the impurities in metals by the Thomas Fermi approximation would explain why such impurities would not interact at long range. Finally the delocalisation of the valence d electrons in transitional metals and alloys would explain the possibility for the magnetic moments of atoms to be expressed as fractions of Bohr magnetons, leading to ferro or antiferromagnetic coupling at short range. This last contribution, produced at the first international conference on magnetism, held in Strasbourg in May 1939, reinforced similar points of view defended at the time in France by the future Nobel laureate Louis Néel. In 1949, Mott suggested to Jacques Friedel to use the approach developed together with Marvey for a more accurate description of the electric-field screening of the impurity in a metal, leading to the characteristic long range charge oscillations. Friedel also used the concept developed in that book of virtual bound level to describe a situation when the atomic potential considered is not quite strong enough to create a (real) bound level of symmetry e ≠ o. The consequences of these remarks on the more exact approaches of cohesion in rp as well as d metals were mostly developed by his students in Orsay. Charles Francis Mott (1877–1967) the son of Charles Henry Blackshaw Mott was an English physicist and educator, and the father of Nobel laureate Nevill Francis Mott. In 1901 while at the Cavendish Laboratory he attempted to investigate the field effect following a suggestion from J. J. Thomson. He married Lilian Mary Reynolds, also a researcher at the Cavendish lab.By 1905 he was the Senior Science Master at Giggleswick School. His wife also taught mathematics there. From 1922-1945 Mott served as Director of Education in Liverpool. C.F.Mott Teachers' Training College was named after him. Contemporary Physics is a peer-reviewed scientific journal publishing introductory articles on important recent developments in physics. Editorial screening and peer review is carried out by members of the editorial board. Doris Kuhlmann-Wilsdorf (February 15, 1922 – March 25, 2010) was a German metallurgist. Giggleswick is a village and civil parish in the Craven district of North Yorkshire, England. It is situated on the B6480 road, less than 1 mile (1.6 km) north-west of the town of Settle and separated from it by the River Ribble. It is the site of Giggleswick School. Jacques Friedel ForMemRS (French: [fʁidɛl]; 11 February 1921 – 27 August 2014) was a French physicist and material scientist. Johannes Hendrick van der Merwe was a South African mathematician and physicist. The Frank-Van der Merwe crystal growth model carries his name and he was awarded numerous South African academic prizes. He is sometimes referred to as the "Father of Epitaxy". His research is seen as fundamental to applications in communication technology. Dr William Keith Burton FRSE (12 October 1922 – 30 December 1996) was English electrical engineer and theoretical physicist notable, according to American physical chemist Robert Alberty, for the publication of his 1957 thermodynamics tables, the first-ever free energy tables for biochemical reactions. Fellows of the Royal Society elected in 1936. See also Template:Gonville and Caius Masters. In quantum mechanics, the Mott problem is a paradox that illustrates some of the difficulties of understanding the nature of wave function collapse and measurement in quantum mechanics. The problem was first formulated in 1929 by Sir Nevill Francis Mott and Werner Heisenberg, illustrating the paradox of the collapse of a spherically symmetric wave function into the linear tracks seen in a cloud chamber.In practice, virtually all high energy physics experiments, such as those conducted at particle colliders, involve wave functions which are inherently spherical. Yet, when the results of a particle collision are detected, they are invariably in the form of linear tracks (see, for example, the illustrations accompanying the article on bubble chambers). It is somewhat strange to think that a spherically symmetric wave function should be observed as a straight track, and yet, this occurs on a daily basis in all particle collider experiments. A related variant formulation was given in 1953 by Mauritius Renninger, and is now known as Renninger's negative-result gedanken experiment. In this formulation, it is noted that the absence of a particle detection can also constitute a quantum measurement; namely, that a measurement can be performed even if no particle whatsoever is detected. Robert Wichard Pohl (10 August 1884 – 5 June 1976) was a German physicist at the University of Göttingen. 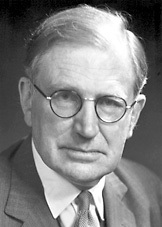 Nevill Francis Mott described him as the "father of solid state physics". The Rutherford Memorial Lecture is an international lecture of the Royal Society created under the Rutherford Memorial Scheme in 1952. It is held at universities in various countries in the Commonwealth, with a stipulation that at least one of every three lectures must be held in New Zealand. Sigurd Zienau (1921–1976) was a physicist notable for the theory of the polaron. The Three Physicists Prize (French: Prix des trois physiciens) is a physics prize awarded by the École Normale Supérieure (ENS) in Paris and the Eugène Bloch Foundation. It is named in honour of the physicists Henri Abraham, Eugene Bloch and Georges Bruhat, who were successive directors of the physics laboratory at the ENS and all of whom died in Nazi concentration camps between 1943 and 1945. The prize was established by Bloch's widow.